The Harvesters notched five more wins over the past two weeks and remained perfect on the season with a 8-0 record. 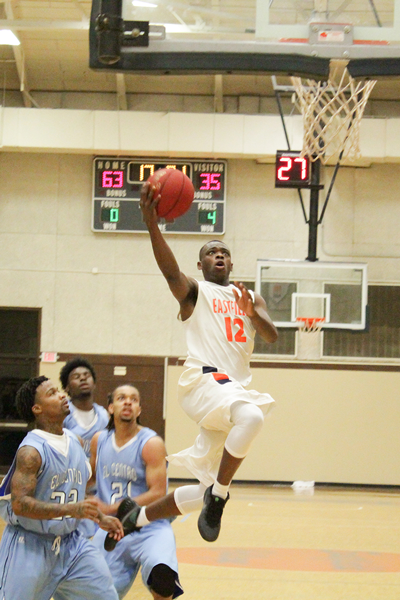 Eastfield leads the na- tion in scoring at 119.6 points per-game, and point guard Tevin Corprew is the nation’s top individual scorer with 35 points per game. Corprew, who also ranks second in the na- tion with 71 assists, won his third consecutive Metro Athletic Conference Player of the Week honor last week. Eastfield shot 54 percent from the field en route to a 40-point thumping at home against El Centro on Nov. 10. Corprew went 9-for-14 from the field and 14-of-16 from the free-throw line to lead the team with 33 points. He also dished out 12 assists. Ed Williams showed off his sharpshooting, draining six shots from 3-point range and finish- ing with 22 points. serves combined for 37 more points. The Harvesters raced to a 30-point first half lead, then coasted to a comfortable road win Nov. 13. Anderson racked up 23 points, shooting 78 percent from the field while snagging a team-high 19 rebounds. Corprew had a game-high 38 points and doled out six assists, while Danzel Whitemon had 10 points, four rebounds and two assists. The Harvesters found themselves clinging to a four-point lead (50-46) at the half before explod- ing in the second half, outscoring Hillsdale 70-20 on Nov. 14. Four starters scored in double digits, led by Corprew, who posted his third double-double of the season with 37 points and 11 assists. Anderson put up his second double-double with 12 points and a team-leading 12 rebounds. Reserves Donald McBride and Sam Kinlaw had solid contributions off the bench. McBride fin- ished with 11 points, and Kinlaw had eight points and 10 rebounds. Corprew had another huge game with 43 points and seven assists as Eastfield more than doubled its opponent’s scoring in a home win Oct. 17. The Harvesters rolled to an 82-point first half and add- ed another 59 points in the second half. Whitemon finished with 20 points and eight rebounds, while Anderson contributed a double- double with 13 points and 11 rebounds. Also scor- ing in double digits were Williams with 14 points and eight rebounds and Derrick Aimes with 12 points. After only a five-point lead at halftime, the Har- vesters had four players score in double-digits to get the win on the road on Nov. 18. Tremondre Anderson snagged a game-high 23 rebounds, 18 of those being on defense, along with having 18 points and five blocks. Corprew led the team in offense having 38 points and 7 assists, and Ed Williams with 14 points. Sam Kinlaw came off the bench for the Harvest- ers and added 11 points and seven rebounds.